'X-Men: Apocalypse' shows the psychological resilience of Scott Summers – AiPT! Kevin Feige on Deadpool sequels being R-rated under Disney: "If it's not broke, don't fix it." How the latest film version of Cyclops developed resilience despite a life of hardship. He’s been a leader and a revolutionary, a husband and a father, a hero and a villain–He’s Cyclops, the first X-Man. The many roles Scott Summers has played since his debut in 1963 have made him one of the X-Men and comics’ most complex characters. In honor of Slim’s full-fledged return from the dead in this week’s Uncanny X-Men Annual #1, AiPT! is proud to present: CYCLOPS WEEK! Cyclops has always been a tragic figure, and as such, his origin has been based in trauma and loss. The story has changed from time to time over the 50+ year history of the character, but it typically involves Scott Summers and his brother Alex (aka Havok) being orphaned in a plane crash, when their parents give the boys the sole remaining parachute. In some versions, Scott receives a head injury in the crash, which is responsible for the inability to control his optic blasts. In others, he can’t control his powers because of a psychosomatic response to the trauma of losing his parents, which results in a Conversion Disorder — the loss of control of a voluntary bodily function or other nervous system response that has no discernible medical explanation, following examination. The story of Scott Summers is also about resilience. He loses his parents, his sight, the ability to control his powers, his home, his brother, and later his wife, and yet still perseveres. 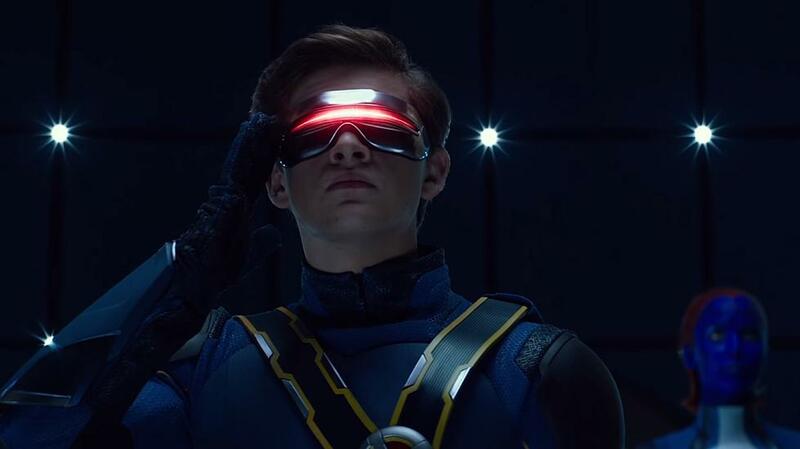 Due to the complexity of his history and the multiple timelines to account for, in this article I am largely going to focus on Tye Sheridan’s interpretation of Cyclops from the film X-Men: Apocalypse. When we first meet this version of Scott Summers, he’s having trouble with his eyes while sitting in a high school class, learning about the dangers of mutants. We witness the first time he discovers his powers after he’s bullied when a cheerleader mistakenly believes he’s checking her out, due to the pain in his eyes. The cheerleader becomes alarmed and notifies her boyfriend, who pursues Scott into the bathroom and threatens him, until Scott’s first optic blast causes massive damage and knocks the boyfriend off his feet. Sheridan does a great job of depicting the fear that comes with this moment, and displays the physical and emotional responses you would expect in a teen who has encountered both “Big T” (potential or actual loss of life, limb, or bodily harm) and “Small t” traumas (bullying, harassment, social isolation, loss of status) in a single incident. Afterward, Summers crumples into a ball and clasps his hands over his eyes. When we next see Scott, he is blindfolded and with two adults we assume are his parents (maybe foster parents, given his typical history) who have called in his brother, Alex, to help him, since he has already actualized his mutant powers. It’s in this sequence we see the foundation for the resilience Cyclops develops in the face of later traumatic events. According to the Substance Abuse and Mental Health Services Administration (SAMHSA), the factors that contribute to Trauma Resiliency in children are the following: Individual Health and Well-Being, Individual Aspects (personality traits, strengths), Life Experiences (exposure or lack thereof to healthy attachments and community/cultural violence), and Social Support. Other important factors include responsive parents and communities, structured activities, and concrete support by parents. In this sequence we see nearly all of these happen for young Scott Summers. His parents show empathy and support, and they get him out of the community in which he’d be a pariah and into the care of Xavier’s School for Gifted Youngsters, under the guidance of his older brother Alex, who was part of Professor Charles Xavier’s first class. Xavier encourages Scott to unleash his power and normalizes the experiences he had among the humans. He even applauds and reassures Scott after his inability to control his optic blasts destroys Charles’ “favorite tree,” which immediately builds rapport and a trusting relationship. Scott’s resilience develops further after being accepted into Xavier’s school, where he is around other kids who are going through similar challenges adapting to their powers. The community and culture of the other students is shown to be very supportive, with one of the teachers (Beast) specially making ruby quartz glasses to help him control his blasts and see like everyone else. Scott quickly flourishes in this environment and there is much less observable anxiety and anger in his presentation. Were it not for this experience with a strong foundation of support and emphasis on development of personal strengths and weaknesses, it is not likely that Cyclops would respond with the same decisiveness and heroism that he did to the events that unfold later in the film. Scott, Jubilee, Jean Grey, and Nightcrawler all sneak to the mall to see Return of the Jedi. Upon their return, they come back to a blown-up school, and Scott learns quickly that his brother died in the blast. There is barely time to process this before Major William Stryker and his team show up to capture the more powerful mutants. Scott and the others must act quickly to remain undetected and attempt to save the others. This sequence demonstrates a different side of resilience in the face of ongoing trauma. While still in danger, there are one of four responses that get activated to deal with the threat: Fight, Flight, Freeze, and Resilience. Based on Scott’s Individual Factors, combined with the new support system, he is now capable of engaging Resilience, which allows him to override the autonomic nervous system responses (F,F,F) and think rationally and strategically in the face of danger, as opposed to just reacting, and he leads the assault on the Alkali Lake facility to free the other mutants and Weapon X (in an amazing cameo by Hugh Jackman). This resilience continues to build throughout the film as he is further accepted by the X-Men and given a defining role in the fight against Apocalypse and his Four Horsemen, during which he demonstrates heroism and bravery despite the massive personal losses he’s encountered in his life. The Lubbock Lights of History Channel’s ‘Project Blue Book’ — how much can we trust those photos?